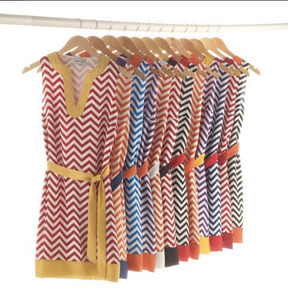 These chevron dresses (new link to the Mud Pie designer's site) are a great gameday option. The dresses come in 6 different color options and represent a number of different college teams. Would I be able to get a purple and white or purple and black one for TCU?? Hi Ellen. I've contacted the shop for you and hope to hear back soon. I'd love to get a TCU one too! Hi Natalia. I've searched online and contacted the seller, Mrs. Polka Dot. The word is that the company, Mud Pie, is sold out nationwide. You all may want to contact Mud Pie directly. I've added a new link to the post for the company.